And let us run with perseverance the race marked out for us, fixing our eyes on Jesus. Peace Children's Home in Kallur, India recently celebrated with One Life child Ravishkelar, who proudly received an overall silver medal in a competitive, district level track and field event. With no parents, Ravishkelar has lived at Peace Children's Home for 6 years. He is a good student and grateful for the support of his One Life sponsor. He also received a gold medal in shot put and a silver medal in the 400 meter sprint. One Life is proud of Ravishkelar and we are excited about the opportunities that are his as he continues to work hard both at school and in the sport he loves. Love Your Neighbor gives our One Life children the opportunity to have fun while doing their chores and contributing to the health and wellness of their little community. Spending the day in their paddy fields ends up being a fun and eventful time of planting rice. Your sponsorship allows us to gift our children a couple times a year with something extra— letting our kids know that they are loved. This summer several of our sites in Thailand chose to give new t-shirts to their children. New Life Children's Home in Yellamanchili bought sports equipment for the boys and jewelry and hair accessories for the girls. We are grateful for your sponsorship and for the joy it brings our children. This past summer, a team—which included several One Life sponsors, took a trip to South Africa to visit our One Life children. 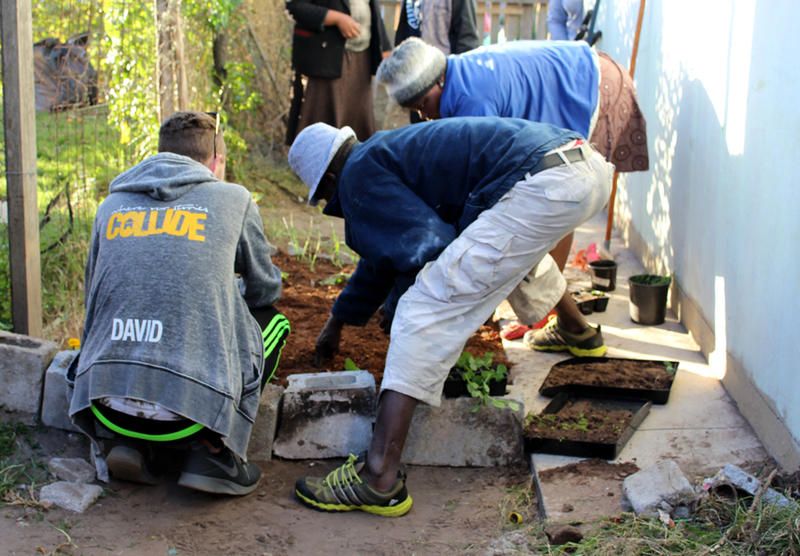 While in Port Elizabeth, the team helped build six starter gardens at the homes of One Life kids. They cleared the area of broken glass, trash, metal scraps and debris and prepared the soil with organic compost. Most of the gardens included spinach, pumpkin, cilantro, tomatoes, beans, peas, cabbage, carrots and potatoes. A trained gardener will follow us and teach the caregivers how to harvest seeds from their vegetables so they can replant and sustain their gardens with minimal cost. These gardens will go a long way in supplementing our children's diets with nutritious vegetables. We finished each garden by building a fence to keep out the marauding goats and chickens. Most of you that are already One Life Sponsors have recently received a letter from your child. For those of you who have not...it's coming! When you get your letter, take a few minutes and respond to your child, personalize your note and answer their questions, or get your children at home to respond. Our One Life kids love hearing from you. Write a note and mail it back to us at One Life Child Sponsorship Program, P.O. Box 860078, Shawnee, KS 66286-0078, or drop it in the box in the One Life area at WFC Lenexa. The letters our children receive from you are gifts—for many of our One Life kids, your letters are their connection to a family they don’t have at home.